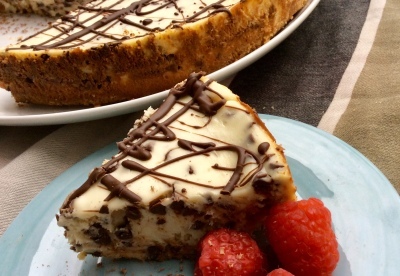 I love cheesecake, but I always thought it was too complicated and fussy to make at home often. Who wants to mess around with water baths and the stress of cake with cracked tops? Not me! 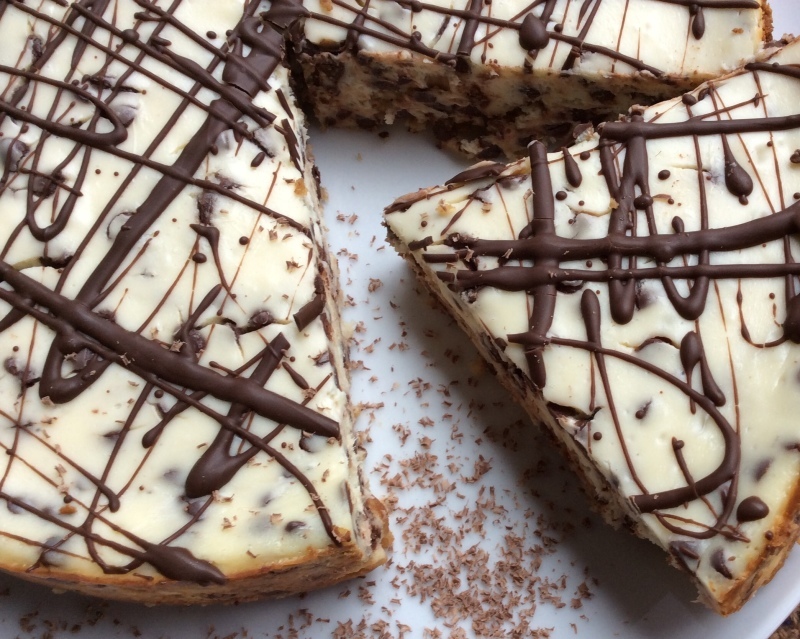 So when my friend Robyn insisted she had an “easy” cheesecake recipe, I had to try it. The recipe lived up to her promise, and very quickly became a family staple. This cheesecake has a short ingredient list, but still manages to have a rich, full flavor with the classic cheesecake-y tang. The top generally does not crack, or does so only slightly. If you have a deeper crack, just top the whole thing with a pile of raspberries or a drizzle of chocolate and call it a day. It will taste so good, no one will notice. Preheat oven 450 degree and lightly grease a 9-inch springform pan. Make the graham cracker crust by mixing graham cracker crumbs, butter, and sugar together until it forms a crumbly paste. Press the crumb mixture into the bottom of the pan and set aside. Beat together cream cheese and sugar until smooth. Add flour (if using) and then the eggs one at a time, mixing just until combined after each addition. Do not overmix. Stir in vanilla and mini chocolate chips. Pour filling into crust and loosely cover the pan with aluminium foil. Bake cheesecake at 450 for 10 minutes. After 10 minutes, reduce heat to 250 degrees and bake for 40 minutes. Do not open oven door. Turn off the oven (still keep the door closed!) and leave the cake in the oven for 1 hour. After 1 hour, open the oven door and let the cake sit in the oven while it cools for about 30 minutes. Leaving it in the oven lets it cool slowly and helps prevent cracks. After 30 minutes, allow cheesecake to cool in its pan on the counter completely and then chill (preferably overnight). Remove from pan and serve plain, with raspberries on top, or with a drizzle of chocolate (to hide any cracks).